Shortly after the 300 show at the People’s Art of Portland, Chris Haberman invited me to participate in a new show during the month of February called “Love of Portland”. The theme of the show is a bunch of artists submitting work about what they love most about the city. It’d be going up the week of Haberman’s birthday, as well as my own. 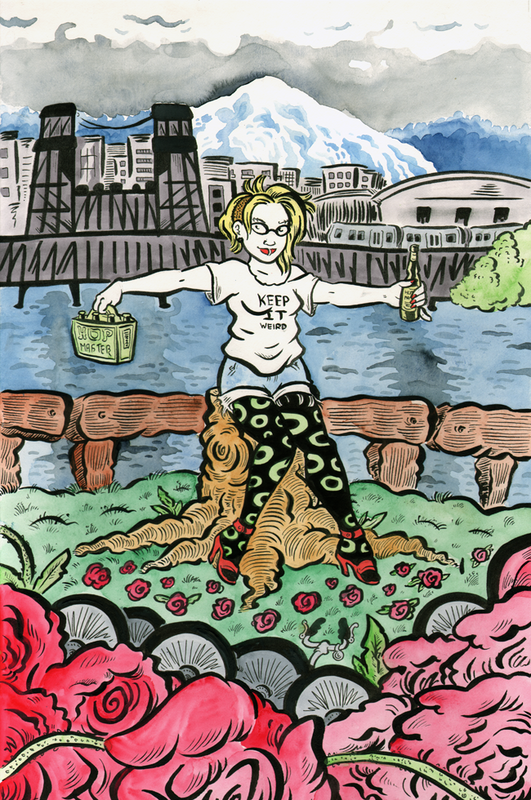 I tried really hard to think of something non-stereotypical that sums up what Portland means to me…but I couldn’t come up with anything in time, so I ended up doing the opposite: a watercolor featuring ALL of the Portland stereotypes! Hipsters, roses, stumps, bridges, rivers, micro brew, mountains, you name it! And I put it all together into one watercolor illustration. The piece is going up February 16th and is available to any who want it for $125. Come check it out!